The fine folks at Burger King sent me their new Fresh Apple Fries (and a fly lunchbag!) to try out and I must say, they were a hit with Chatterbox and Giggles. The "fries" (fresh apples cut into fry shapes) were fresh, crunchy and sweet - so much so, that the girls didn't even bother with the low-fat caramel dipping sauce that came with them. I did try the sauce though and it was quite yummy. It's about time that moms were offered an alternative to boring, fatty french fries for their kids' meals. In fact, it's gotten so that Chatterbox doesn't even eat the french fries anymore. Of course, a lot of the popular fast food restaurants do offer some substitutions, but I think these BK Fresh Apple Fries are one that the kids will actually eat. Making the thought of yet another drive-thru dinner easier for moms to stomach. Wanna try out the BK Fresh Apple Fries for yourself? I'm giving away 2 BK Crown Cards worth $10 each, courtesy of the King! Just leave me a comment and I'll announce the winners on Monday 8/4. So yesterday we all went to Delaware for the day since Hubby had a meeting to attend. Things were going swimmingly with me toting all three kids around a new city: we went to the Zoo; made bead necklaces in the park; ate lunch; checked out a toy store, and then...on the way out of the Mall, Giggles slipped and fell and chipped.her.tooth!!!! Of course she also cut her bottom lip a bit so she was beside herself crying and I was so shaken up when I realized that a piece of her tooth was missing. Anyway, I immediately called the pediatrician who said to call the dentist who said to come in first thing this morning. Giggles was fine after a few minutes, and we left to pick up Hubby from his meeting. And I was dreading having to say: "Hi honey! How did it go? We had a great day. With one little mishap..."
This morning we were at the pediatric dentist bright and early. Giggles was a little scared, but hung in there for an X-ray and mouth exam (all as a result of being bribed with Dora stickers). In the end, the dentist said there had been no permanent damage done and she was fine. The dentist advised against repairing the tooth for aesthetic purposes, because Giggles is so young and will be losing that tooth eventually. Also, she has a fierce thumb-sucking habit which would loosen any filling or cap and could be dangerous. So, my baby will have a chipped smile for the next few years!! I feel so bad, but it could be worse. I felt so guilty, but my mom assured me that there is nothing to feel bad about and that kids break limbs and injure themselves all the time and it's not anybody's fault, it's just being a kid. Intellectually, that makes perfect sense, but seeing her "new" smile...I still can't help feeling bad about it. FYI: jelly sandals + shiny mall floor tile + active toddler = BAD NEWS!! 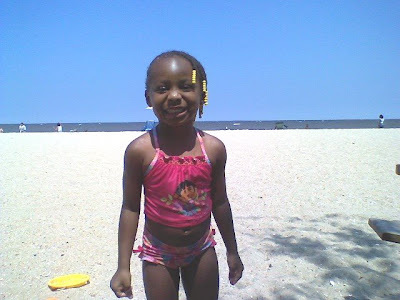 Am I a bad mom for not correcting Chatterbox when she calls her bathing suit a "babe-ing soups"? It's just so cute that I can't stand to correct her. Ok, I'll do it next week. I promise. 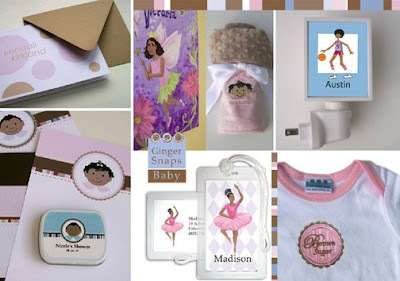 Ok, I have to tell y'all about the cutest online gift boutique: Ginger Snaps Baby. What's unique about this boutique is that its products are inspired by children of color, which is so great, because chic baby items made especially for brown babies are rare! No matter what the color of your bambino though, you are sure to find something precious at Ginger Snaps Baby. The owner, Michele Duger, was gracious enough to send me some samples of her products, and they.are.adorable! Really. I'm in love with the Bag ID tags personalized with my girls' names. They are just darling. And, I'm a sucker for stationery, so I was tickled pink to receive some personalized notecards in a pretty and stylish print. With matching, round, address labels. So cute! So during your next Windows shopping trip, make sure to check out Ginger Snaps Baby! 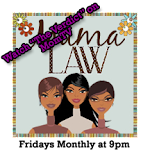 MamaLaw readers can get 20% off their purchase by entering the coupon code JUSTICE20 at checkout. And, for a limited time, you'll receive free address labels with the purchase of personal note cards. Okay, now I'm Laughing my A@@ off!! Oh, and that doesn't include the cost of shipping. "Unfortunately, the state of Florida will not be offering its usual sales tax free week during 2008. In the past, the sales tax holiday was voted upon in the state legislature, but the measure was not brought up for a vote this year. Should the state of Florida decide to offer a sales tax free week again in 2009, this site will be updated to include those dates." I look forward to tax free week every year. My single friends enjoy the annual sale at Nordstrom's or things like that, but me, I look forward to the usual week in early August/late July where I can buy all the school uniforms, clothes, and school/office supplies tax free. The savings add up. I haven't heard anything about this year so after Googling it this morning this is what I find. Outrageous! First, I'm forced to decide between buying gas for my car or feeding my family and now this!! What do they mean, "the measure was not brought up for a vote this year"?? At least put it up for a vote and vote no. But to not even put it on the table is insulting. We need our tax breaks!! We need lower gas prices!! I don't want to worry about my 12 MPG vehicle when I'm picking kids up from school and I want to be able to buy fresh fruit and milk for my family without having to pay ridiculous prices for it! I can't wait until November because I am ready for a new administration. Change is coming people. Okay, back to cleaning the kids rooms before they come back from their trip at the grandparents'. I'll have to update you guys on our summer trip later this week. Having a newborn in the house has been hectic...fun...but hectic! (Did you catch that Mommy Guilt Reflex?) And so naturally, blogging fell by the wayside. But, things are finally settling down and I'm back on the block. Or blog, as it were. And I have so many things to post about. First things first - here are some recent photos of my bambino. He's so cute and cuddly, if not a little lacking in the sleeping department (at night anyway). The other question I get asked the most (after "how's the BABY?!") is "how are the girls adjusting to their new baby brother?" Up until this week I was answering "fine!" or "great!" or "they just adore him!" But for some reason, this week all that changed...I guess they realized that he is here to stay. Giggles started getting unusually whiny last week, but now it's on a whole other level. Everything is grounds for a meltdown: not enough ice in her drink; a broken blue crayon; the ending of the Dora episode - you name it. The worst of it though, comes when it's time for the nanny to leave everyday. It's likely because she gets the nanny's undivided attention all day long while evil, old Mom has to constantly nurse, change, and hold that doggone baby. But seriously, Giggle wails and screams and tries to run out the door when the nanny leaves. It was so heartbreaking that the nanny even offered to take Giggles with her for the night. She usually calms down within 15 minutes or so, but it's really nuts. Then there's Chatterbox. She's really been doing fine until yesterday. Up until then, she has been very helpful with the baby and very loving towards him. But, yesterday the nanny was going to take the girls to the park as she often does, but Chatterbox had her own meltdown! She screamed and wailed that she didn't want to go and that she wanted to stay HOME! WITH! MOMMY! And then proceeded to dramatically change her mind three more times. She ended up staying with me and we made cupcakes for the neighbors together. It was fun. And I could tell she was happy. (I suspect Giggles was happy too, to have the nanny all to herself at the park.) And so all's well that ended well. And I imagine the adjustment to the new baby will take some time. My "Mom to 3" advisors (Justice Jones and my SIL) have told me that the transition will not be easy and that the best thing I can do is spend one-on-one "Mommy Time" with each of them indivudally. I've already started doing this and am looking forward to next week when the girls' gymnastics classes start. They are going to be in different classes on different days and so we'll be able to talk in the car, to and from the class, and maybe we'll go to lunch afterwards or something like that, just the two of us. Giggles' class is a "Mommy and Me" class, so that will be even more great. And right on cue, the Babe is whimpering for me through the baby monitor, so that ends my blogging time for today. See you next time on the New Adventures of Old Justice Fergie. This season's gonna be good.